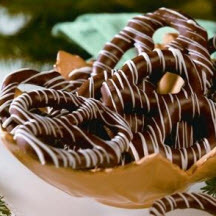 Chocolate-covered pretzel twists, festively drizzled with melted white chips. Cover tray or cookie sheet with wax paper. Place chocolate chips, 2/3 cup white chips and 1 tablespoon shortening in medium microwave-safe bowl. Microwave at HIGH (100%)1 minute; stir. Microwave at HIGH an additional 1 to 2 minutes, stirring every 30 seconds, until chips are melted when stirred. Using fork, dip each pretzel into chocolate mixture; tap fork on side of bowl to remove excess chocolate. Place coated pretzels on prepared tray. Place remaining 1/3 cup white chips and remaining 1/2 teaspoon shortening in small microwave-safe bowl. Microwave at HIGH 15 to 30 seconds or until chips are melted when stirred. Using tines of fork, drizzle chip mixture across pretzels. Refrigerate until coating is set. Store in airtight container in cool, dry place. Makes about 2 dozen coated pretzels. WHITE DIPPED PRETZELS: Cover tray with wax paper. Place 2 cups (12-ounce package) HERSHEY'S Premier White Chips and 2 tablespoons shortening (do not use butter, margarine, spread or oil) in medium microwave-safe bowl. Microwave at HIGH 1 to 2 minutes or until chips are melted when stirred. Dip pretzels as directed above. Place 1/4 cup HERSHEY'S Semi-Sweet Chocolate Chips and 1/4 teaspoon shortening (do not use butter, margarine, spread or oil) in small microwave-safe bowl. Microwave at HIGH 30 seconds to 1 minute or until chips are melted when stirred. Drizzle melted chocolate across pretzels, using tines of fork. Refrigerate and store as directed above.